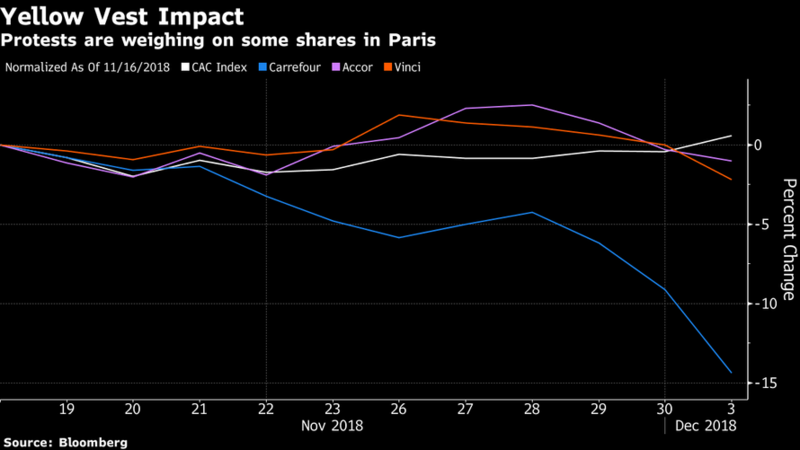 In order to make the tax cuts work, the French government will need to find ways to cut spending that doesn't hobble growth, as well as tax measures that will stimulate the economy. For Macron, the stakes are high as he doesn’t want to damage the credibility he needs to push for reforms in Europe. The European Commission has already said his existing budget is at risk of non-compliance with EU rules. The protests have crippled revenues across the country, with some large supermarkets seeing drops as much as 25 percent. Hotel bookings have suffered a similar fate. Toll-road operators Vinci SA and Eiffage SA meanwhile have seen their share prices decline as they have opened toll booths to let cars pass freely. 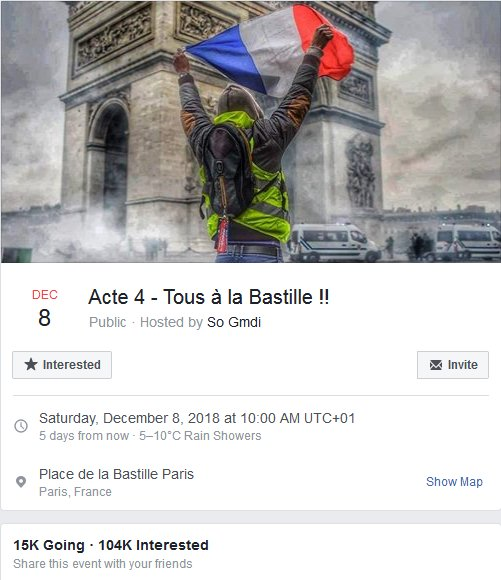 Whatever Macron has planned, he better act fast - as there are currently 15,000 angry French Yellow Vests signed up for next Saturday's protests in Paris; three times as many as last weekend, while 104,000 are a "maybe." The elites have gone too far. The costs of the 2008 financial crash have been met by ordinary people, not the greedy bankers & financial spivs who caused it. The people have had enough of austerity & falling/stagnant wages. What’s happening in #France now is only the start. 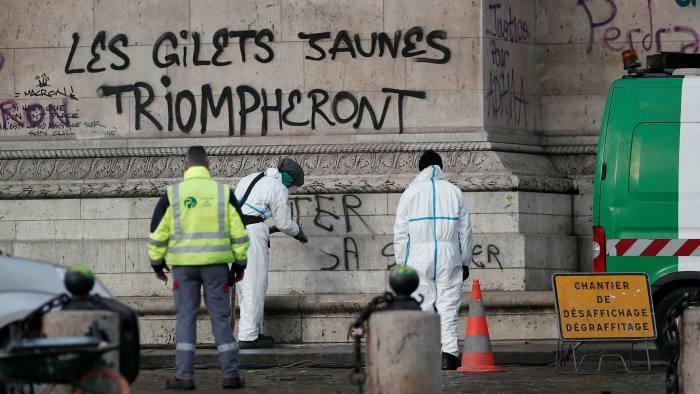 Leaders of the so-called "Yellow Vest" movement have rejected demands to negotiate with the French government after President Emmanuel Macron ordered his prime minister to hold discussions, according to AFP. Macron and top officials are now in full damage control mode amid the most violent protests France has seen since 1968. 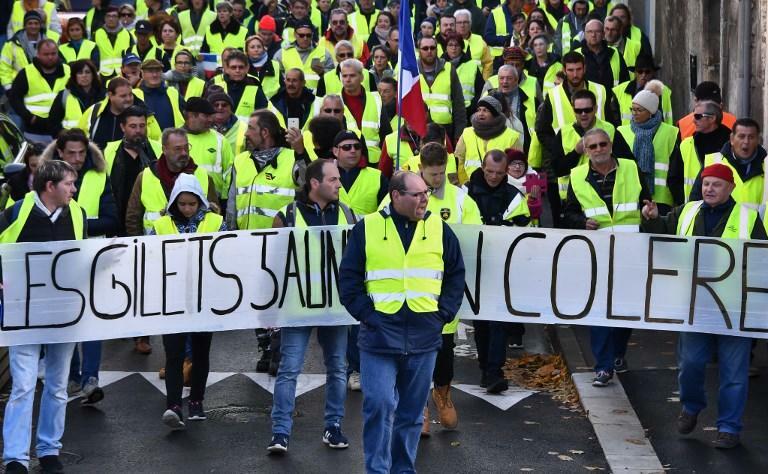 Approximately 136,000 demonstrators donning yellow reflective vests were recorded across France on Saturday - of which approximately 5,500 protested in the French capital according to the interior ministry. The previous weekend saw 166,000 demonstrators, and 282,000 the week before that. 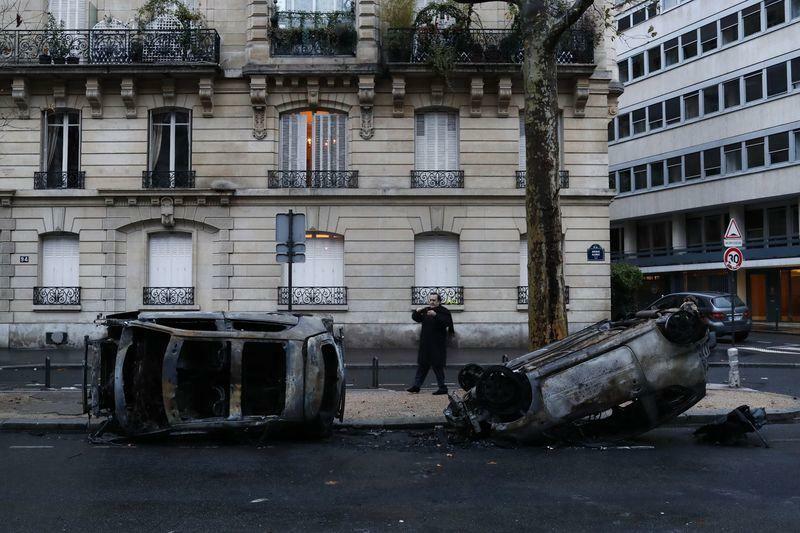 According to the interior ministry, 412 people were arrested in during Saturday's violent clashes in the French capital, while 263 people were injured. 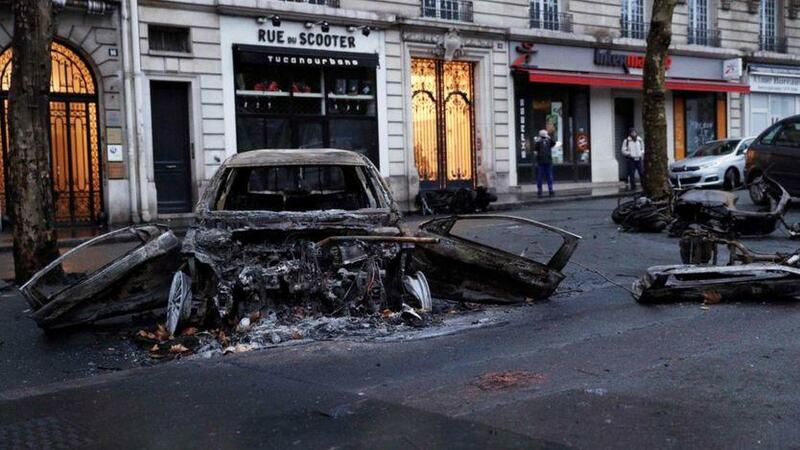 The worst hit areas were the wealthy west and central Paris, where stores were smashed and looted, dozens of cars were burnt, and police forces were overwhelmed by Yellow Vest protesters. Amid the chaos, an 80-year-old woman was killed in Marseille when a police tear-gas canister was launched into her apartment window while she was trying to close the shutters. She was taken to a nearby hospital but died during an operation after suffering shock, according to a local media report. She has become the third casualty in the demonstrations which began three weeks ago. On Monday, Macron held an urgent security meeting - after which ministers said that while "no options have been ruled out," they had not discussed a state of emergency as had been previously reported. Conservative leader Marine Le Pen who attended the meeting warned that Macron could become the first French president to order troops to open fire on his own people in 50 years, and that he should abandon his plan to raise taxes on fuel while lowering gas and electricity prices. The demonstrations, meanwhile, have had a noted effect on business in the region. Finance Minister Bruno Le Maire met with business representatives to assess the damage caused to businesses over the weekend. "The impact is severe and ongoing," Mr Le Maire told the AFP news agency. 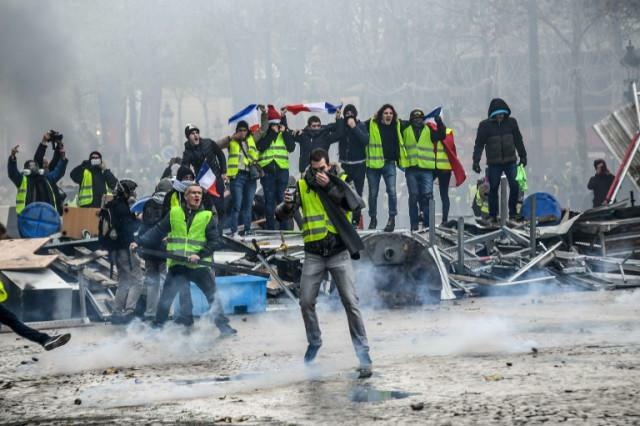 The protests have continued into Monday according to the BBC, which reports that about 50 Yellow Vest protesters blocked access to a major fuel depot in the port city of Fos-sur-Mer, which is close to Marseille - while gas stations across France have run out of fuel after restrictions on purchases were instated. 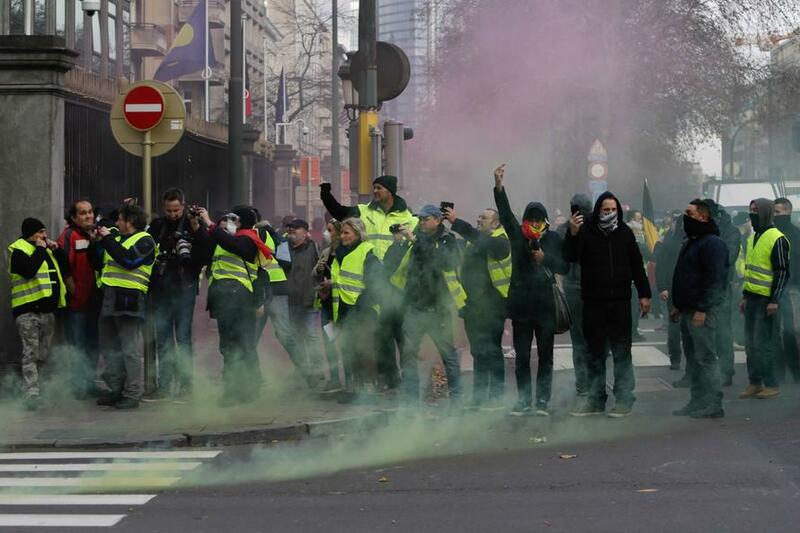 As if things weren't bad enough for Macron, on Monday French private ambulance drivers staged further demonstrations against several healthcare and social security reforms which they say could affect their jobs. 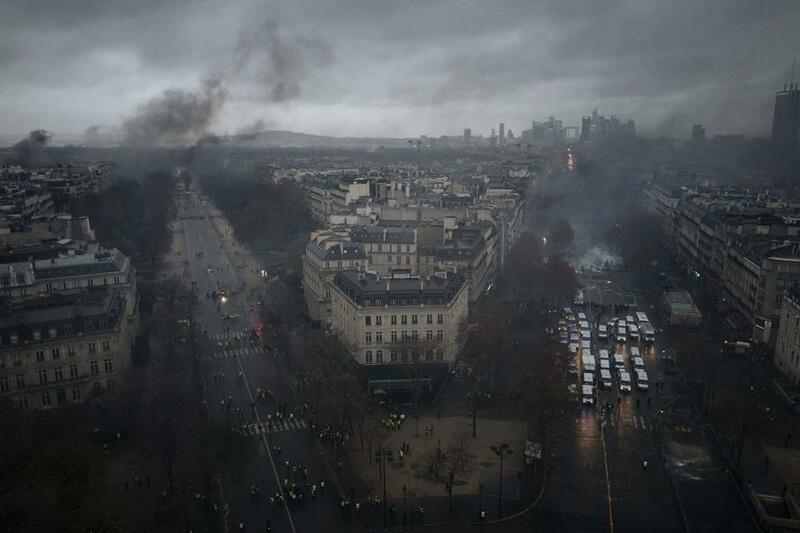 Paramedics blocked the Place de la Concorde near the downtown National Assembly at around 5:30 a.m. local time, sounding their sirens and waving banners condemning the reforms, according to France Info. Depuis plus de 7H, le blocage des ambulanciers devant l’Assemblée Nationale et la Place de la Concorde se poursuit. 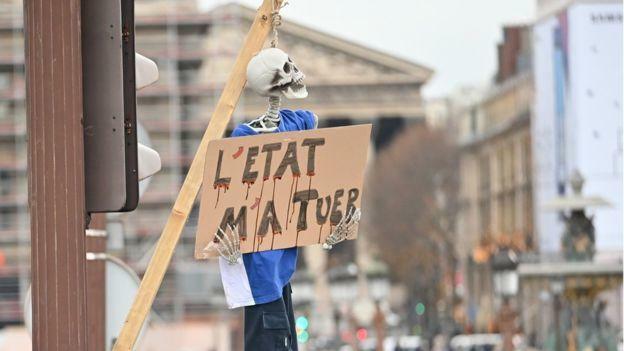 Dozens of trucks formed a blockade from Paris's Place de la Concorde to the French National Assembly. One protester told the Reuters news agency: "[The reforms] will bludgeon us financially and destroy our companies. We're going to have to fire people, that's for sure." It is unclear if the ambulance drivers are part of the Yellow Vest movement - however recent polls have shown that most of France supports their cause. 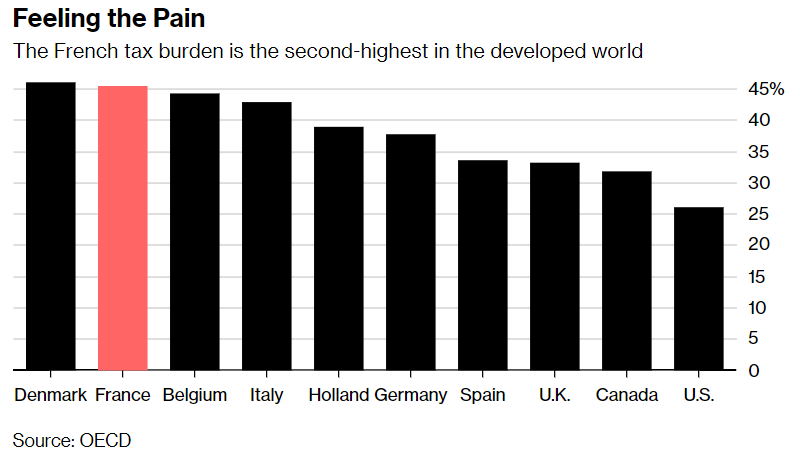 Similiar protests have broken out around Europe, as Yellow Vest demonstrations have spread to Belgium, Italy and the Netherlands.